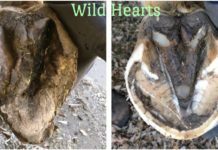 Maria Siebrand, Hoof Care Practitioner and barefoot advocate, is a promoter of natural horse care and natural trimming methods to effectively help the equine. She says seasonal laminitis cases inevitably rise in early spring. Here are some of the things to be aware of, both to recognize and to prevent a laminitis attack. Laminitis is an equal opportunity affliction: any horse is a potential victim. Springtime presents the most danger, with fall running a close second. Every year, at least 5% of the horses on my roster will present with signs of laminitis in early spring. The severity of the attack can be so mild it’s barely discernible, where a horse who has been 100% sound suddenly goes just slightly tender over rugged terrain. Or it can be acute, with the horse clearly very painful on one or all four feet. So what it is about spring that brings on these attacks? Lots of things! Probably the most frequent trigger is something tasty that’s growing or blooming. All that lovely, tall, thick green grass looks like just what a horse should be eating, right? Well, not really. Horses are actually adapted to thrive on a spartan diet. Lush meadows are to horses what a Double Double with Cheese, Fries and a Shake are to us. Of course, we all know enough to introduce this rich new food incrementally. And some horses – in particular those that live a very active lifestyle – do just fine with a moderate amount of grazing lush spring grass. But be careful! Watch your horse carefully for signs of hoof tenderness as you gradually introduce pasture time. Some horses show tenderness with very little change in their carbohydrate intake. 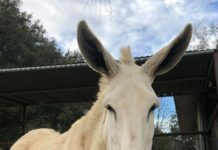 If your normally sound horse goes suddenly ouchy after the first spring shoots sprout up around his pen, chances are even a little is too much of a tasty thing for him. Don’t for a minute think that just a few bites won’t hurt. 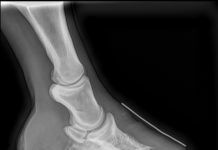 Sometimes, just the seasonal hormone changes that take place are enough to trigger a laminitis attack. Pregnant mares are especially at risk: much like humans can develop gestational diabetes, pregnancy can cause the mare to become insulin resistant. But even mares who are not in foal, and stallions, can experience hormonal changes dramatic enough to cause or exacerbate insulin resistance. Vaccines are another possible laminitis trigger. In fact, anything that stimulates or stresses the immune system can cause a laminitis event. Spacing vaccinations out a couple of weeks, instead of giving them all at once, might help. If there is one vaccine in particular that your horse appears to be sensitive to, you might discuss tighter testing with your vet to eliminate unnecessary vaccination. Illness, fevers, and colic episodes can all cause laminitis as well. Some tickborne illnesses in particular are known to be a trigger, so if you’re in an area where ticks are prevalent, be watchful. Anytime your horse is moderately lame, call your vet and your hoof care professional at once. Quick diagnosis and management are extremely important to minimizing damage. In the meantime, if you suspect laminitis, immediately removing any recently introduced foods or supplements is a prudent step to take. 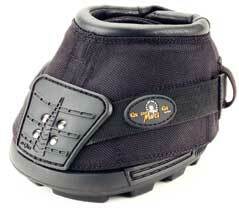 Protective horse boots and hoof pads are often extremely helpful to keep the horse comfortable. If your horse fails to become more comfortable in boots and pads, wrapping the feet with substantial padding might be necessary. For a step-by-step tutorial on applying a bandage, click here. 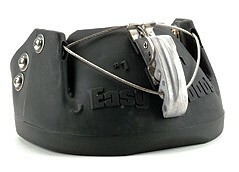 EasyCare has the boot styles to assist your horse in the quest for complete comfort. Protective boots and Comfort pads will get your horse through those difficult times. I should also point out that I’ve seen several bermuda samples test unusually high in carbohydrates — 12 and 13% — this spring. If boots and pads don’t help, soaking the hay to remove some of the carbs can help tremendously. Research shows that soaking can remove up to 70% of the carbohydrate content in hay. Also, don’t think that just a few bites of the greenery growing by the trail or your horse’s stall won’t hurt…even just a mouthful can cause enough of an insulin spike to cause inflammation in the laminae!